Be sure to join Billy and the Legendary Sweets November 7 at 7:30 pm at JRC in Evanston to celebrate the release of the CD!!! Last night I went into the studio with the “Sweet Sisters” – Rena Newman, Emma Chanen, and my eldest daughter, Hannah Kaplan. And as an incredibly special treat, my youngest daughter, Ruthie, also sang on the piece! The Sweet Sisters sang have been singing with me since the first time I shared Shabbat Sweet in 2011, so it was particularly delightful to have them be the last voices is session for the recording of Shabbat Sweet. They recorded lovely three-part harmony for Shalom Rav. Have a listen to this rough mix (and keep in mind there will still be a bass and piano part added; and there will be a piano solo by Steve Rashid in the currently “empty” section). The Kickstarter Campaign was a Year Ago? Just about a year ago I pressed a button and started an insane, vulnerable, incredibly-intense month. I launched the Kickstarter campaign to record Shabbat Sweet, the music and melodies I wrote for Erev Shabbat, the Friday night Sabbath Service. I don’t know if I’d ever worked harder, had more emotional turbulence, or gambled more than I did that month. It was exhausting, stimulating, engaging, frightening and looooooooong. Every day, nearly every moment, I thought about how to reach out to others and share my vision, and how to get them to back the project without sounding like I was begging (though I always felt like I was). By the end of the month almost 200 dear, wonderful, generous, fellow-insane people became supporters of the project, and the process of recording the service began. Now it’s a year later, and we’ve completed two-thirds of the recording. I had imagined the recording would be finished by now, and that I’d franticly be putting the final touches on the production of the physical CD. And, as I should have figured, my imagination was in over-achievement mode. I found that I had to maintain a balance among the many things I love – my family, my work, my music, my friends and my self – so that none of them suffered greatly while I invested time and energy in any one of them. So I appreciate the patience of my beloved backers as the final pieces get recorded by the middle of the summer, if all goes as planned. We’re going to take the time we need to take get the recording right. We want to create the best sounding, most interesting and delightfully pleasing recording of Shabbat Sweet we possibly can make. I can’t thank all the backers of the project enough for your generosity and patience as we plod on. I imagine it’s been difficult for your wait, as well. So as an early gift, I’ve created a “Shabbat Sweet Eight Track” page on the website where you can stream and listen to all eight tracks now! Just click HERE and use same password you use to hear the audio updates. Email me (shabbatsweet@gmail.com) if you want your memory refreshed. And if you’d like to listen to the current completed tracks, and are not already a backer, click HERE to donate to the project ($10 minimum) and I will be glad to email you the password. We already plan to record about four more prayers, but there are even four more we could record if we had more funding. Just sayin’! Shabbat Shalom, and What a Couple of Days We Have Ahead!! 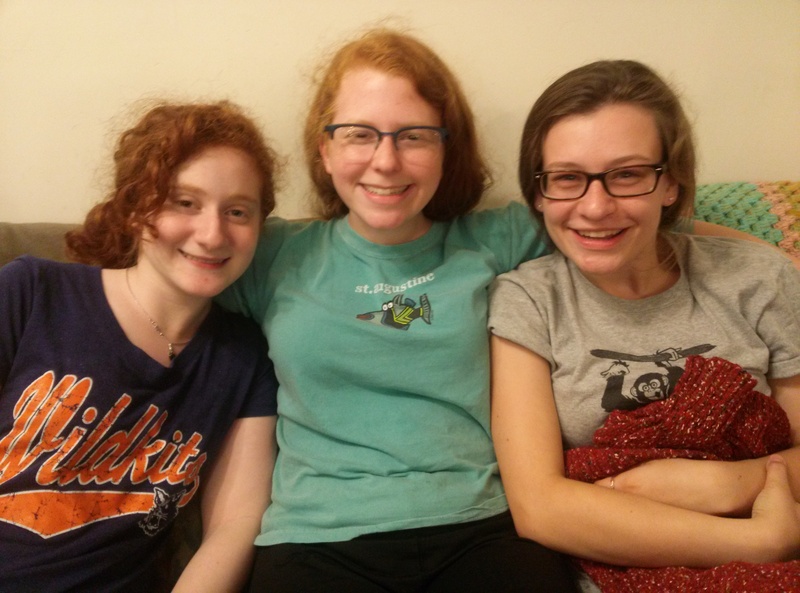 While last weekend I spent the weekend with several dozen teenagers on a retreat, and I joyfully got to share several prayers from Shabbat Sweet with them, this Shabbat will be much quieter at home with my family. May yours be sweet!!!! And then Saturday night I’ll be competing in the first ever Battle of the Jewish Bands at the Meyer Kaplan JCC on Saturday night. Come check it out and cheer us on! I’ll be playing with two of three of the Sweet Sisters, Mike O’Mara on Keyboards, Dave Newman on drums/percussion, Robert Castillo on bass (he’s new with us! ), and Jonah Karsh on clarinet! Sunday night, my daughter, Hannah, and my “other daughter”, Emma, will go into the studio to record tracks with the current four tunes. Monday night, Alex Koffman and Don Jacobs, from the Maxwell Street Klezmer Band, along with Jonah Karsh on clarinet, will be recording tracks on those four prayers. And then… I think all the tracks for the current recording will be in place, and we’ll be going to final mix!!! Very exciting!!!! One of my dear friends asked me what I was doing this weekend. I thought about it for just a moment, and the answer was simple: practicing. You see, on Monday, I’m going to record the baritone ukulele parts for the current set of recordings for Shabbat Sweet. Yes, I’m excited (as I always say), and nervous (I think I say that a lot, too!). When I started practicing along with the current tracks, over winter break, I was just trying to play cleanly, using the same approach to each piece I’d always taken. I did some “demo” recording on my phone, thanks to a simple and amazing multi-track recording program (thanks, Android!). And I didn’t like what I heard. With the rhythm section we recorded, the playing I’d always been doing didn’t seem to add anything. So I took a Kierkegaardian leap-of-faith, and just started TRYING different rhythms and approaches. Like an actor trying different accents and emotions with the same words. And I think I’ve come up with uke parts that make an interesting contribution to the recording. It’s been a musical stretch for me, and I’ve loved the challenge. I played one of the parts for my wife last night, and her response was just what I had hoped for – and she’s my best, and most honest critic! Stay tuned!!!! And Shabbat Shalom. Since Hanuka is tonight I want to give you a present… MY MUSIC! Throughout Hanuka, I want you should enjoy the music I’ve recorded so far. So… have a listen by clicking HERE! Hungry for some new Jewish music? Well, I want you should have “a taste of Shabbat Sweet,” the new EP of the first four recordings from Shabbat Sweet. Have a nosh (a taste) and buy your copy at CDBaby and Facebook! Very soon you’ll be able to download them from iTunes, Amazon and Google Play! I’ll let you know when that happens. Also, tomorrow I FINALLY go back to the studio to start recording the next four pieces: the Candle Lighting, V’Shamru, Oseh Shalom and Adon Olam. I’ll be practicing this afternoon, getting the tempos, remembering where we’ll have instrumental solos, etc. And since Hanuka is coming, I thought I’d share with you a video of one of my Hanuka songs from my CD called “Dradle ‘Round the Tree.” Enjoy! I've listened to your CD and it's breathtaking! So unique, cool and beautiful. What an accomplishment! I am so impressed with the beauty and joy expressed in these pieces of music. I thoroughly enjoyed listening to all of them. It's a work of love and passion.